The earliest recorded date for the observance of International Women’s Day was 28th February 1909 in New York and was organised by the Socialist Party of America. From 1909 to 1913 it was celebrated on various different days/months but in 1914 settled on 8th March (possibly because that day was a Sunday), and now it is always held on this date in all countries. Since that time events, marches and festivals are held internationally celebrating and recognising women’s equality. Organisations such as the United Nations join in, and their official theme this year was “Be Bold for Change”, aimed at increasing female representation in the workplace to 50%. Since 1969 Dundee International Women’s Centre addresses the needs of women by providing a space for women to socialise, learn and come together. To celebrate International Women’s Day, an exhibition was put together by English for Life Class which explored the native cultures of women and their interpretations of the Scottish culture. 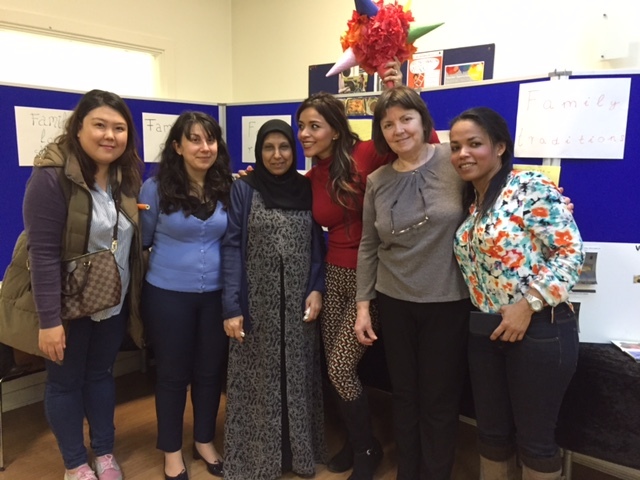 The centre also hosted sewing classes and a challenging Henna workshop. There were Arabic cooking classes and an Indian banquet which offered a mastery of Indian cuisine (and some recipe cards if you needed more practice). The attendees of the classes believe that women should be appreciated every day. Workshops organised in the centre were helpful as it enabled social integration in a relaxed environment. This can lead to the empowerment of women and help improve mental health and increase in self-confidence. DIWC focuses on the black and ethnic minority population of Dundee. Recently, we have been celebrating our staff, learners and volunteers as part of our ‘Women of Dundee’ campaign. This gives women the opportunity to share their experiences, stories and journeys in life. These stories do not shy away from the difficulties women face. They talk about the isolation they face in their daily life and the reality of their experiences. DIWC’s International Women’s Week highlighted the work which we do every day. During this week social media and magazines were filled with articles respecting the achievements of great women past and present: Parks, Pankhurst, Yousafzai, Curie. On behalf of DIWC, as part of International Women’s Week, we would like to celebrate our great women. This week was dedicated to you. International Women’s Day was about you, our learners, staff, and volunteers. Let us keep celebrating each other and ourselves.